Thursday January 18th 1894 We took an early start to the valley. It has turned colder and the roads were froze. We took dinner and had a pleasant visit at Aunt Libs. Went up to Aunt Ems for a couple of chickens to bring home with us. After supper we went down to Will Fosters to spend the evening had a pleasant time did not get home till after ten oclock. A beautiful moon light night. 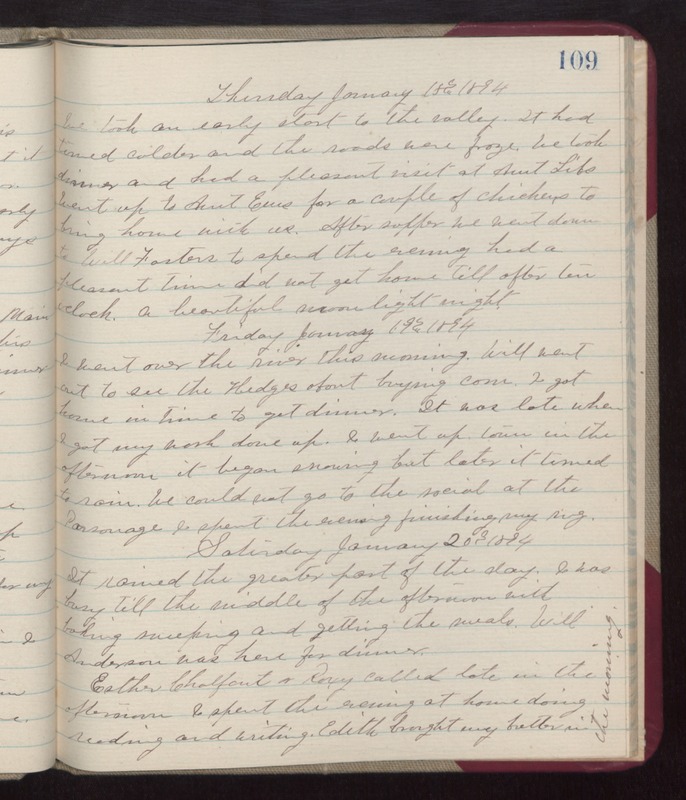 Friday January 19th 1893 I went over the rive this morning. Will went out to see the Hedges about buying corn. I got home in time to get dinner. It was late when I got my work done up. I went up town in the afternoon it began snowing but late it turned to rain. We could not go to the social at the Parsonage. I spent the evening finishing my rug. Saturday January 20th 1893 it rained the greater part of the day. I was busy till the middle of the afternoon with baking, sweeping, and getting the meals. Will Anderson was here for dinner. Esther Chalfant & Roxy called late in the afternoon. I spent the evening at home doing reading and writing. Edith brought my butter in the evening.